European beds are measured in centimetres (cm) and come in a variety of widths and lengths which correspond approximately to the named sizes found in other ares of the world. For Northern European bed size (German, Dutch, Swedish etc) the standard length is generally 200cm, for Southern European bed sizes (French, Spanish, Italian etc) 180cm and 190cm beds are equally as common. There are many more variations in bed sizes across Europe than in other parts of the world with the 200cm x 90cm being the most common single bed size supplied by pan European retailers. The extra long 210cm (6'7") and 220cm (6'11") beds are usually only found in the Germanic and Scandinavian countries. The length of this standard is dictated by the average height in the Northern European and Scandinavian countries which is around 1.80m (5'11") for men. The European 160cm width beds are the equivalent of the queen size across the rest of the world, a slightly narrower 150cm version is also commonly available. 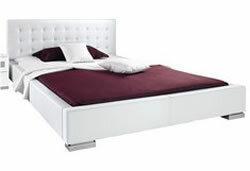 European 180cm (5'11") width beds are equivalent to the King size beds in South America. 200cm width beds are closer to the North American, Australian and New Zealand King size beds.